1 of 3 Coat slow cooker bowl with nonstick cooking spray. 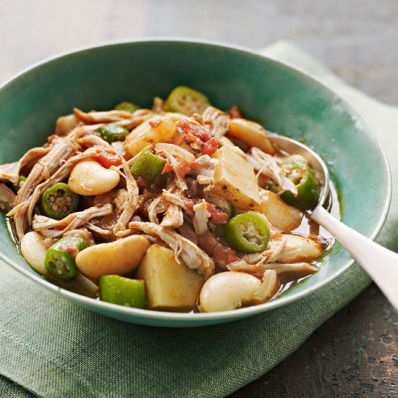 Place chicken, potatoes and onion in bottom of slow cooker. In a medium bowl, stir together broth, tomatoes, tomato paste, oregano, 1/2 tsp of the salt and 1/4 tsp of the black pepper. Pour over chicken and potatoes. 2 of 3 Cover and cook on HIGH for 6 hours or LOW for 8 hours. One hour before end of cooking time, stir in beans, okra and remaining 1/2 tsp salt and 1/4 tsp pepper. 3 of 3 Shred chicken off bones and serve with vegetables.